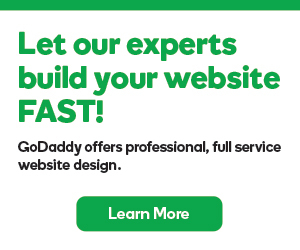 The GoDaddy Email Marketing Starter plan, included with Website Builder and Online Store, offers 50 total mailings and up to 50 contacts. Use whatever combination that best meets your needs. For example, you could send five newsletters to a list of 10 people or one newsletter to a list of 50 people. The Starter plan includes all the features of the Pro plan. However, the Pro plan allows up to 50,000 emails per month and up to 5,000 contacts. The Starter plan doesn't limit how many contacts you can collect from your site visitors. You can also use the Website Builder contact manager with other programs, such as adding them to a spreadsheet. You can upgrade your Starter plan at any time — and keep all your contacts. Take a look at how the Starter plan compares with the three most popular GoDaddy Email Marketing plans. Website Builder Create email subscribe form for site visitors. Create Contacts manually to expand your email list. Online Store Create email signup form for site visitors. WordPress WordPress: Email signup forms.